Clearly Good Music: Who Is Nader? Nader is one of the most promising moombahton and future bass stars in the Chicago music scene. Alongside his partner Rampage, the pair have performed live with major moombahton stars and produced groundbreaking tracks. Most recently, Cy Kosis released a very important album on Think 2wice Records and this is exclusive remix was done by Nader to support the release and was featured on Walmer Convenience, an influential future bass blog. 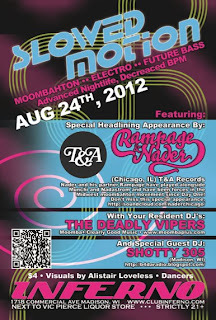 Go ahead and download Nader's remix of #Dope and make plans to see him August 24th at Slowed Motion at Inferno Niteclub.